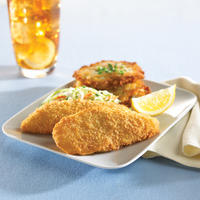 MRS. FRIDAY’S® OVEN READY BREADED COD FILLETS 3-4 OZ. Keep frozen until ready to use. Do not refreeze. CONVECTION OVEN Preheat 375°F. Place product on baking sheet and cook for approximately 12-14 minutes or until product is crisp. DEEP FRYER Heat oil to 350°F. Add product, shaking baskets occasionally to prevent from adhering. Fry for approximately 5 - 5 1/2 minutes or until golden brown.